We have a complete lineup of new and used cars for the Cheboygan, Petoskey, Gaylord and Rogers City region, and our customer care continues long after you buy or lease a Dodge, Chrysler, RAM, or a Jeep – thanks to our dedicated car service and auto repair team. Our Dealership makes the process of securing your next Dodge, Chrysler, RAM, or Jeep easy for you. Stop in and see what makes us different! Our Dealership carries a full model lineup of New Dodge, Chrysler, RAM and Jeep vehicles including the Dodge Charger, Dodge Challenger, Dodge Durango, Dodge Journey, Dodge Dart, Dodge Grand Caravan, Chrysler Pacifica, Chrysler 200, Chrysler 300, Chrysler Town & Country, Jeep Wrangler, Jeep Wrangler Unlimited, Jeep Cherokee, Jeep Grand Cherokee, Jeep Compass, Jeep Patriot, Jeep Renegade, Ram 1500, Ram 2500. We invite you to shop around and compare our prices with other Dodge, Chrysler, RAM and Jeep dealerships in the Cheboygan area. Let us know what you find, and let us give you our best price on the same model. We strive to earn your business and want you to be a Fernelius Chrysler Dodge Jeep Ram customer for life! For a huge selection of used cars in Cheboygan, come down to Fernelius Chrysler Dodge Jeep Ram at 11283 N Straits Hwy. We have a huge inventory of like-new vehicles ready for the Cheboygan roads. Whether you’re looking for a used sports car, work truck, SUV, convertible, sedan, coupe or something else, the salespeople at Fernelius Chrysler Dodge Jeep Ram will help you track one down. The financial experts at Fernelius Chrysler Dodge Jeep Ram are available to answer your questions regarding car loans and leases. Have a question about interest rates, loan terms, or programs for individuals with bad credit, or no credit at all? Call us and get the answers you need. At Fernelius Chrysler Dodge Jeep Ram we’ll help you get auto financing quickly so you can go about your busy schedule with your new vehicle. For truly helpful assistance in securing a car loan in Cheboygan, visit us today! Visit Fernelius Chrysler Dodge Jeep Ram for all your automotive service needs, and know you’re getting the help you deserve from industry experts. We provide the Cheboygan region with Dodge, Chrysler, RAM and Jeep car repairs done to factory specifications to ensure your vehicle is always performing at its best. We also keep a wide selection of original Dodge, Chrysler, RAM and Jeep car parts for quick order fulfillment. If we don’t have your part in stock we can acquire it quickly. 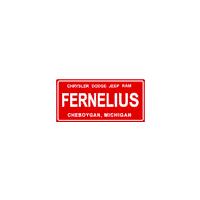 To find out more about Fernelius Chrysler Dodge Jeep Ram in Cheboygan take a look at our About Us page, and follow these Directions to visit our dealership. We hope to see you soon! Whether it’s a new or used Jeep, RAM, Chrysler or Dodge, our skilled auto enthusiasts will help you find exactly what you’re looking for. Looking for reliable service or parts center serving the Cheboygan, Petoskey, Gaylord, Harbor Springs or Indian River areas? Come on down and get your fix at Fernelius Chrysler Dodge Jeep Ram today! A big bonus to the new Jeep, RAM, Chrysler and Dodge lineup is options. Models like the RAM 1500, Jeep Cherokee, Jeep Renegade, Chrysler Pacifica and Dodge Grand Caravan each feature unique features that truly set them apart from the bunch. Yet they all find common ground with their well-crafted and high-quality design. Satisfy it with a test drive of a new Jeep, RAM, Chrysler or Dodge model that piques your interest, here at Fernelius Chrysler Dodge Jeep Ram in Cheboygan. If a new Jeep, RAM, Chrysler or Dodge isn’t what you had in mind, then why not take a look at our wide variety of used vehicles? Every one of them a gem, a complex story of previous ownership, with personality emanating from every line and curve, all at very affordable prices. If you’re still concerned about payments, our skilled financial team will help you secure a loan or lease that can fit nearly any budget. You don’t have to fret about auto financing in Cheboygan. That’s because our car loan and Jeep, RAM, Chrysler and Dodge specialists want to help you reach your goal: to drive home in the vehicle you desire. Fernelius Chrysler Dodge Jeep Ram takes the time to explain all the details, making sure you understand every comfort, safety and entertainment feature (there are many!) and get the best deal possible. It’s part of our job; but also, we enjoy helping turn dreams into reality. To make sure your vehicle stays in tip-top shape throughout your entire ownership experience, the automotive experts in our car service and repair department will always have you covered. From providing you with the latest Jeep, RAM, Chrysler, Dodge parts to making sure your car is maintained for peak performance, they are truly a driver’s best friend. You don’t have to take our word for it though; come on down to Fernelius Chrysler Dodge Jeep Ram in 11283 N Straits Hwy in Cheboygan, MI today. Whether you’re a local driver or you hail from the surrounding Petoskey, Gaylord, Harbor Springs or Indian River areas and beyond, we’ll strive to give you the best dealership experience we can muster. Come for the cars, come back for the camaraderie.